Granite is the hardest natural material you can choose for your countertop, so you'd expect cutting it to be more challenging than cutting other materials. While that's true to some extent, the procedure and tools you use to cut granite aren't more sophisticated than those you use to cut other hard materials. You can use a circular saw with a diamond-tip grinding blade, but you have more control, and you can cut curves, with an angle grinder. Lubricating the cut with water keeps dust down, protects the blade and prevents the stone from cracking. It's important to work slowly when cutting granite. Set the granite you're going to cut on a stable surface with the polished side facing up. Lay painter's tape along the approximate path of the cut line or lines. If you're also cutting out a hole for an under-mount sink, lay the tape around the perimeter of the sink. Measure and mark the cut line on the painter's tape with a pencil and tape measure. 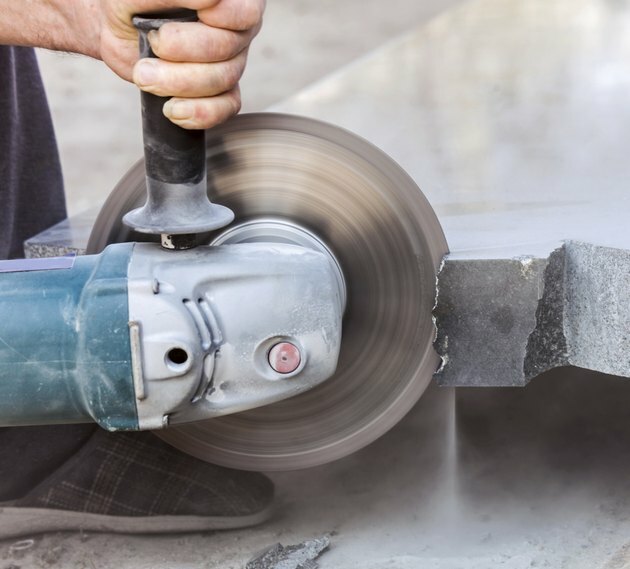 Equip a heavy-duty angle grinder with a 4 1/2-inch diamond-tipped concrete-and-brick cutting blade. Fill a bucket with water and immerse a sponge in the water. Put on a pair of goggles and protective gloves in preparation for cutting. Squeeze water from the sponge onto the cut line and begin cutting with the angle grinder. Guide the tool carefully along the line, cutting just deep enough to score the surface. Make a single pass along the entire line in this way. Squeeze water liberally onto the granite as you make the second pass. If the tape is beginning to bunch up or peel off, you can remove it. Cut about halfway through the granite on this pass. Cut all the way through the countertop on the third pass. Continue to lubricate the cut by squeezing water onto the countertop with a sponge. Support the off-cut with a sawhorse or an assistant before you reach the end of the cut to prevent it from breaking off and falling. Lift the off-cut away from the countertop when you finish the cut. Replace the cutting disk with a 100-grit sanding drum and sand the edges of the cut to clean them up.